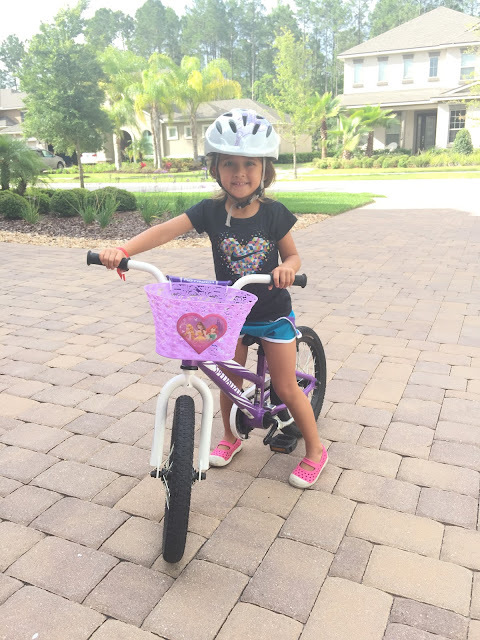 A few weeks ago, I was driving through the neighborhood with Paige and we saw her friend Olivia riding her bike while her mother jogged. Paige knows I go running, and has been wanting to come with me ever since. On Monday morning, I was getting ready to go for a run and she asked to come along and I decided to let her give it a try. We put a water bottle in her bike's basket and set out. 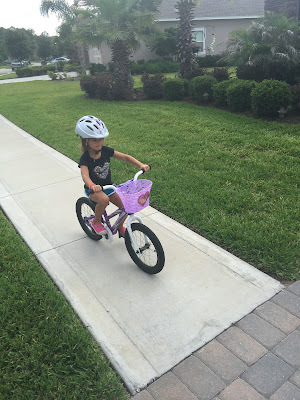 I first did a mile loop in the back of the neighborhood, then stopped near our house to see how she was doing. I gave her a choice to keep going or go home and I was surprised that she wanted to continue. We ran to the front of the neighborhood, played at the park for a couple minutes, then ran home. It took us about an hour to do it all and according to my phone's GPS, we went a little over 4 miles total. She never complained once and got a nice workout.